A linear regulator integrated circuit (IC) is a DC-to-DC buck converter system that reduces a DC supply from higher voltage level to a lower voltage level, thus it requires that the input voltage is always higher than the regulated voltage. Output voltage, however, may become higher than the input voltage under specific situations or circuit configurations, and that reverse voltage and current may cause damage to the IC. A reverse polarity connection or certain inductor components can also cause a polarity reversal between the input and output terminals. 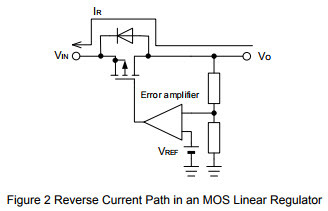 This application note provides instructions on reversed voltage polarity protection for ICs. This entry was posted on Sunday, December 31st, 2017 at 1:00 pm	and is filed under app notes. You can follow any responses to this entry through the RSS 2.0 feed. You can skip to the end and leave a response. Pinging is currently not allowed. DC to DC “Buck Converter”? That is Utter bolox! that dissipate the unwanted energy as heat. and with *very* good dynamic regulation. a lot more than just a diode between input and output! (and other) application and data books for these things. Shocking, ROHM must have got some rubbish new staff or intern to work on this. Watch out, onlines sellers in China are doing the same dumbass thing lately. I’ve corrected one vendor on this in the past month. Of course the Chinese vendor’s excuse was that they do not have the relevant tech knowledge, but I don’t think ROHM can give the same excuse. Of course, for avoidance of ambiguity, I am following up on Dave noticing the “DC-to-DC buck converter”. So which ROHM staff thinks the FET there is a converter?